(Bloomberg) -- Whole Foods Market says it will lower prices on hundreds of grocery items this week, the latest effort to reshape the grocer’s pricey image under Amazon.com Inc. The Seattle retail giant touted a round of price cuts immediately after buying Whole Foods in August 2017 and over the last year worked to roll out grocery delivery from store locations and introduce discounts for Amazon Prime members. Whole Foods, which operates fewer than 500 stores, says the latest price cuts average about 20 percent. Amazon acquired Whole Foods in an effort to catch Walmart Inc., Kroger Co. and Costco Wholesale Corp. in grocery sales. It still has a long way to go. There are about 10 Walmart locations in the U.S. for every Whole Foods. 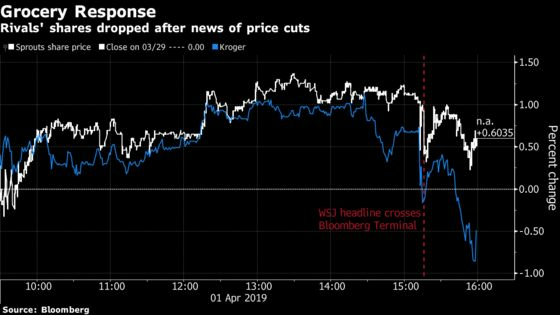 Shares of rival grocers like Sprouts Farmers Market Inc. and Kroger slipped on the news. Amazon.com Inc. gained 1.9 percent during the trading day. There have been price increases, too: The Wall Street Journal reported in February that rising costs for packaging, ingredients and transportation had pushed Whole Foods to increase prices on hundreds of items late last year and early in 2019. The newspaper also reported the news of the current price cuts earlier Monday. Whole Foods said in an emailed statement that the grocery industry as a whole was dealing with higher costs and that it had absorbed much of the price hikes instead of passing them on to customers.